Here at Sprout, we believe that we do our jobs best when we know our customers. On our social team, that means viewing customers’ Twitter profiles and any past interactions at the moment we’re responding to them. Have they asked this question before? Is this their first interaction with us? Is their profile description casual or professional? With that in mind, we’ve decided to put relevant information front and center, so you have the context you need every time you send a reply. 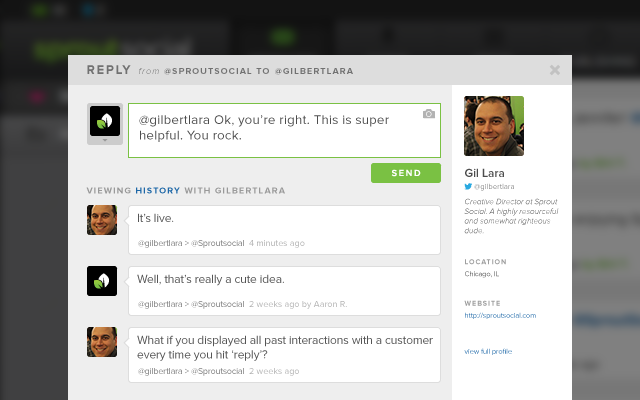 Now, you see profile information, history, and the full context around your current conversation right next to the reply box. Immediate access to this information means you can reply quickly, with fully informed responses. You’ll know whether the last interaction was a few hours or a few months ago, with you or someone else on your team, and what was discussed, so you can pick up where you left off, and amaze your customers every time. Of course, you can still select which handle to respond from, shorten links, drag and drop to add photos, see if another team member is in the process of replying, and switch to DM. We hope that having access to this additional information as you engage with your audience makes it easier for you to do your jobs – it certainly makes it easier for us to do ours!